Life is Awkward: Kids Hurt. I have been meaning to post but I have just no idea where I am supposed to start. Sunday night was horrible. I mean not the worst night ever but it wasn't good. My baby has discovered that she has the unique ability to hurt herself. I really wish that she didn't. Everyone in her family is already clumsy, so that was bound to be what would happen, but she really didn't need to also get my ability to royally hurt myself on top of that. Sunday my little Bean was on her trike, the kind that you just push around while they are buckled in. She loves it, even though she is only 1 and can't reach the peddles just yet. She loves to go "weee" (cause who doesn't). Some how she managed to get her foot lodged between the front wheel and the bar fork that holds the wheel on. That was bad enough. What was worse was she managed go get her whole foot to turn 180 degrees, so that even though she was sitting on the bike still, her heal was pointing straight up, and her toes were pointing to the ground. Even as an RN I couldn't look at it for very long. 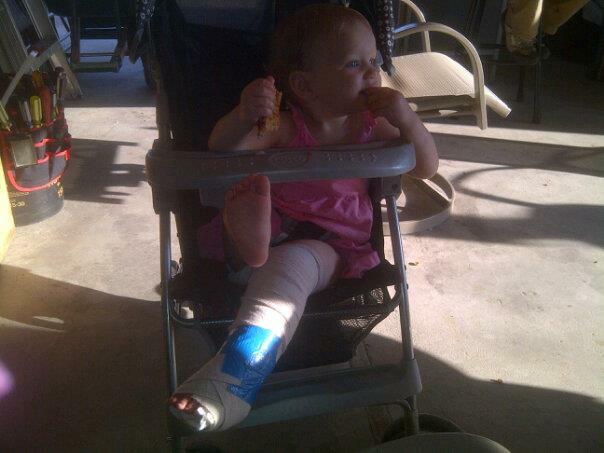 I've never been good with broken bones let alone my own kid's. Thank god my father is good under pressure and Papa managed to get her unstuck in quick fashion. As soon as she was free and in mama's arms she stopped crying. So we took a trip to the ER and after a 5 hour wait (because that's what we do with a 1 year old, make them wait for 5 hours in an ER), where she was amazing even though she was in pain, and hadn't eaten, and wasn't allowed to play. She was my hero. She yelled at the Dr. when he put the cast on her leg, when it was declared that she likely had a spiral fracture in her tibia (very not surprised), and flirted with a 4 yr old boy. She had a busy night. She was just wonderful. Now she still has a cast, even though it's just a half cast, so she can't walk. This is what's causing her issues right now. The cast took away her pain for the most part, but that doesn't mean she is able to walk. Man does she get mad. She's still in a much better mood than anyone else that breaks a bone. She's just the most brave person ever. Bean, with her cast that has duct tape on it, to keep her from pealing it off. In theory it'll keep her from pulling it off. I bet when I get up in the morning she has it all unwrapped so she can stand up.